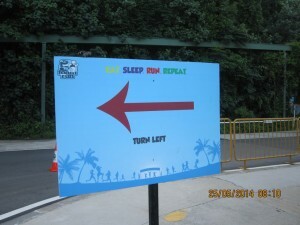 "The 5k Foam Run" Race review - by Chelza | JustRunLah! Extra set of clothing? Checked. Courage to crawl through the sand? Checked. Enthusiasm to be soaked in foam and water? Checked. 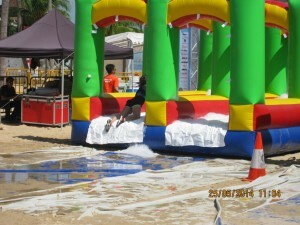 At 8.15am, I arrived at the starting point of the 5k Foam Run- Siloso Beach. All participants are supposed to arrive about an hour before the timing of your selected wave so as you can guess it, my selected timing is 9.15am. The earliest timing is hereby 9am sharp. I passed by the Sapphire Pavilion where many of its volunteers, who were decked in orange T- shirts, were already setting up. Participants who did not have any friends or family to help them in looking after their personal belongings can then leave their items or bags at the Sapphire Pavilion. At around 8.45am, many of the participants for the earlier waves were already at the starting point, waiting to get into the pen that is fenced up -taking selfies with the selfie stick, doing warm-up exercises and pinning up their race bibs. However, the host and several of its volunteers were late so the race was delayed a little. 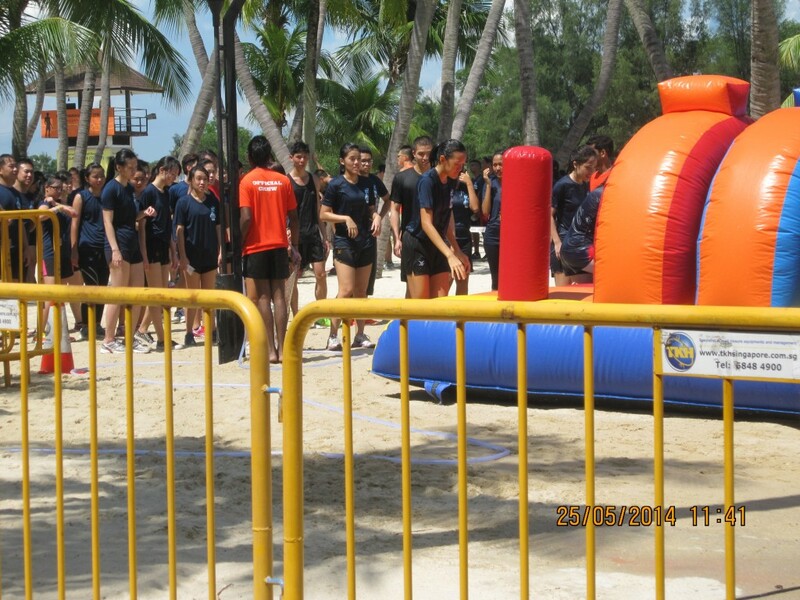 Yet, we were glad to have the pumped-up music to keep our enthusiasm going whilst we were waiting. When the pen is finally opened, the host started briefing us through the details of the race. 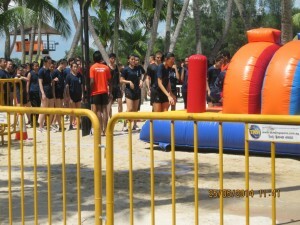 At the starting point, only 20 to 25 people were allowed to race to prevent overcrowding at the obstacle stations later. The race consisted of 6 obstacles in which many of them required you to be soaked in sand, water and foam. Creating atmosphere was what the host did best. 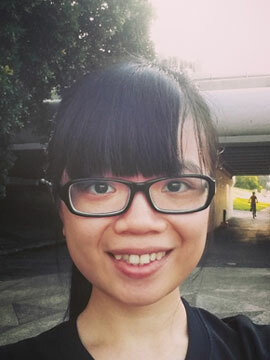 She gathered each small group of us at the starting point to take a group selfie, greeted us with her loud bubbly voice and most importantly, urged us to roll in the sand and foam at the starting point. Buddies were hurling foam at each others’ faces and pushing each other into the foam before the race even started. We ran all the way to Pelawan Beach where not only our 1st water station was located at, but also, our 1st obstacle. The 1st obstacle is to jump through many tyres. Being short and small-sized, it was pretty tough for me to jump accurately into each tyre yet, it served as a great warm-up for other obstacles later on. Ever been jealous of Hollywood actresses running along the beach with ease and grace? Well, we ran along the sandy beach yet, without any ease and grace. Running on the sand itself is not a joke at all. Stability is a crucial point to care about and many of the runners were concerned about sand getting into their shoes. Yet, this was what was unique about the run itself! How many races have you joined that gives you the chance to run along a sandy beach like a Hollywood actress? The 2nd station was to test your stability. Each of us have to run through floating platforms out in the sea without falling into it. It was similar to those water games that Running Man’s fans would have known. As this station can be a little daunting for people who do not intend to fall into the sea, the volunteers were then encouraging and motivating enough to get people who have fallen into the sea or who were hesitating whether or not to skip the obstacle, to get them going and succeeding in the end. In fact, I overheard one girl claiming that falling into the sea was the best part of the run since the weather was scorching hot and that served as a cooling point. 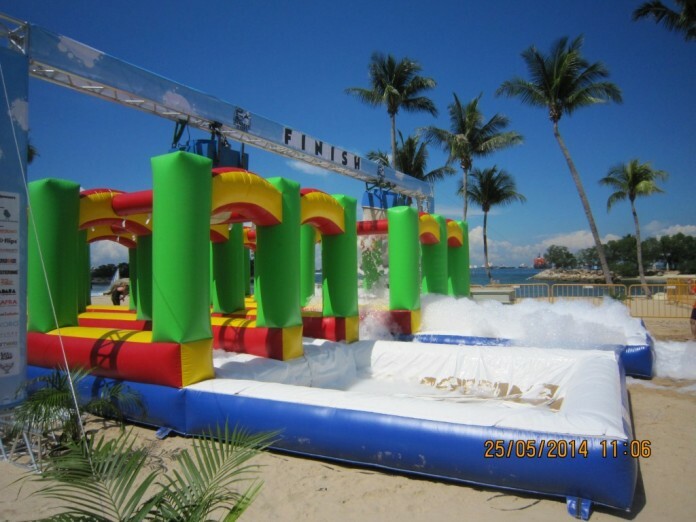 The next few stations were mainly inflatable slides as you slide into foam and water. 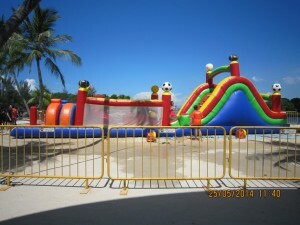 It was definitely a delight to witness friends holding hands and sliding down together, couples splashing foam at each other, kids immersing themselves in the bouncy-castle-lookalikes. As this is a non-competitive run, many families participated together, especially those with younger kids. However, this would be a hassle for people who were there to run competitively as many of the participants did not intend to finish the run fast and ended up walking instead. As the paths for running were narrow, they then jammed up the paths and might affect the timings for competitive runners. Yet, we all have to bear in mind that this is a fun run and timing is not important at all. What is important then? It is to be soaked in fun, foam and fantastic obstacles! 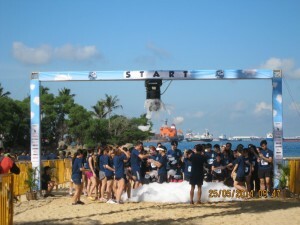 At the end of the run, face towels were given and volunteers with water hose will act as a cleaning station for you. Slippers that we were entitled to can be collected at one of the booths whilst polaroid photos can be taken at $2 for each photo with extra props provided. Not to forget, SKORA set up a booth there too selling apparels and shoes. As many of us have said, running can be a social activity. That was proven true for me for this run as I have made 2 new friends during the run. I am not sure about many of the other runners or even, you who are reading this but I have always been making new friends for every race that I have participated. They are usually the ones that pushed you through the run. However, everything has a room for improvement. The same goes for this run. The volunteers and host can be more aware of punctuality since many of the participants looked bored whilst waiting for the run to start. Moreover, the overcrowding issue for each stations should be solved since waiting under the hot sun is not exactly ideal for many of the runners. In addition, running paths can be wider and more clearly indicated with a barrier or something instead of small orange cones. Besides all these, the run has proved to be one of the most enjoyable runs ever. Yes, it is indeed a hard time washing off the sand and foam after that but the scenery and fun that you get from the run made it all worthwhile. Most importantly, these fun, laughter and joy and never be washed away. Enjoy the photos I have taken for the run. I will definitely join this again! thanks for the review Chelza. did you run on Saturday or Sunday? Hey I ran on Sunday too but early in the morning. Well, I would say it was good enough due to the fact that it is the 1st time that they are organising. it. It would be great if you can feedback to them about it. I am sure they are looking forward to your feedback for a better run next year! I totally can understand. Hopefully they will take the feedbacks into serious consideration!